MP4 is one of the most common video formats supported by media players, mobile devices, TVs and video streaming sites. But MP4 video not playing errors on VLC, Windows Media Player still occur quite often. Why can't you watch MP4 files on your TV, PS4, iPhone iPad, Android mobile devices or media players? What does this have to do with MP4 decoders? Let's start with what MP4 is. MP4 is just a container format and could be encoded with different video and audio codecs, such as H.264, MPEG 4, AVC, DivX, XviD, AAC audio codec, to name a few. Your MP4 player, TV, and mobile devices only support a certain video and audio codecs contained within the MP4 container. That's why an MP4 decoder or MP4 codec packs needed, with which users can solve MP4 playback errors. An MP4 codec pack enables users to avoid getting trouble to play MP4, but it comes at a cost. While video codec packs may make your computer crash and they always brim with other components. Take a look at the best MP4 decoder program we pick out, and follow the below guide to decoding MP4 to MP4 with other codecs, AVI, MOV, M4V, MP3, etc. If you want a full packaged video decoding program coming with efficient MP4 video decoding and low CPU usage, MacX Video Converter Pro would be your thing, which offers a complete solution for MP4 file decoding. Built in 370+ video audio codecs, it can decode MP4 to 180+ video formats and 14 audio formats, needless of any MP4 video codec pack, say MP4 to MP4 with other codecs, MP4 to AVI, MP4 to MOV, MP4 to MP3. The support for QSV acceleration, Multi-core CPU utility and HT tech makes it running at the fastest speed - decode a 490MB 2160p UHD MP4 file in seconds with minimum CPU usage. Optimized by HQ Engine, there's no quality loss. It can be used to repair corrupted MP4 video to fix MP4 not playing on VLC, QT, Windows Media Player etc. MP4 video player. MacX has a friendly UI and is very easy to use. Free download the MP4 decoder software for macOS or for Windows (Win 10 also supported) if you haven't, run it and get started following the guide below. Click "Add File" icon and select an MP4 file from your computer to load, or simply drag and drop the file to the main interface. The file will be loaded very quickly and the program enables you to choose an output on the popping-up Output Profile window. You can decode MP4 with any codecs to MP4 with H264 video codec and AAC audio codec (recommended) or MP4 encoded with MPEG 4 and MP3, or decode MP4 to MP3, AVI, WMV, MP4 to MOV, MKV, FLV etc. format for editing, uploading etc. uses. 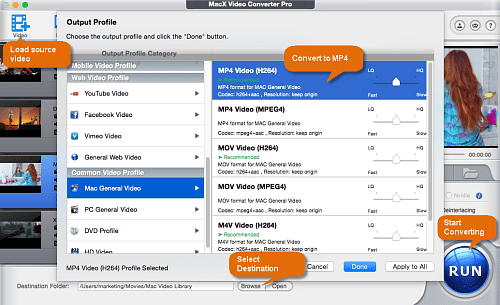 Click "RUN" to start decoding MP4 file in a click with the video converter for Mac. Intel Hardware Encoder is enabled by default to speed up MP4 video transcoding. * The MP4 decoder can serve as an MP4 encoder to transcode other video format, 4K UHD video, MKV, AVI, MOV, FLV, MTS, AVCHD etc. to MP4 format. * Download video from YouTube, Facebook, Instagram and many more sites in MP4 format or directly download FLV, MKV, MTS etc. video to MP4 format. * Compress MP4 video when decoding or encoding MP4 file by lowering resolution, bit rate, frame rate etc. * Work as an MP4 editor to edit videos, such as trimming, cropping, adding subtitles/watermarks etc. MP4 container format has many different video and audio codecs. We list the most commonly used ones below and you can check out what codecs your media player or TV, computer, mobile devices support. To know exactly the video audio codecs of your MP4 file, you are recommended to download MediaInfo for macOS or for Windows, which is an open source application that displays detailed info about media files, including video and audio codecs. MP4 video converter & encoder can solve MP4 not playing errors caused by unsupported codecs, there're some other methods to play MP4 on Mac/Win smoothly. MP4 video coding format: MPEG-2 Part 3, MPEG-4 AVC/ASP, H.263 (outdated), VC-1, Dirac, and others. MP4 audio coding format: AAC, MP3, AC-3, Vorbis, Apple Lossless, SLS, ALS, and others. Many users who are googling video codec converter may find out that there're many video codec packs showing as results. What is a video codec pack indeed? A codec can be used to encode or decode video. The MP4 codec pack is a kind of software package that includes various codecs. MP4 video codec packs make MP4 video playback easier without not playing error in MP4 video players like VLC due to video or audio codecs incompatibility with operating system. Both work for MP4 playback error caused by unfriendly codecs. But MP4 codec pack always come with other adware or plugins and conflict with other software installed on your computer. What's more, compared with MP4 decoder software, MP4 video codec pack can lead to high CPU utilization issue. We don't recommend users to install any MP4 video codec pack. Free download the MP4 decoder for Mac or for Windows to easily decode MP4 video file to MP4 with other codecs or decode MP4 to MKV, MOV, AVI, WMV, FLV etc. formats without losing quality in a fast speed. 100% clean, no plugins, no spyware, no components.